Much Ado About Nothing marks Bi Jean Ngo directorial debut with Delaware Shakespeare. Ngo appeared as an actor in Community Tour productions of Pericles and As You Like It. She is a recipient of the F. Otto Haas Emerging Artist Barrymore Award and is a founding member of PAPA (Philadelphia Asian Performing Artists). She most recently received the Fox Fellowship Foundation Award for Artist with Extraordinary Potential from TCG (Theatre Communications Group) and appeared onstage as Ariel in Lantern Theater Company&apos;s The Tempest in spring 2018. Joining Ngo in the park this summer is Community Tour alum J Hernandez (Pericles, As You Like It) as Benedick and Barrymore Award-winning actress Krista Apple as Beatrice. Michael Hahn will once again compose all-original music. The part of the good Friar Francis will be played by a rotating cast of local faith leaders from the Delaware community, including Rabbi Michael Beals of Congregation Beth Shalom, the Rev. Edwin Estevez of Grace Methodist Church, the Rev. Roberta Finkelstein of the First Unitarian Universalist Church, the Rev. Emma Horn of First Presbyterian Church - Newark, the Rev. Brian Lewis of St. Elizabeth Catholic Church, Dr. Todd Townsend of The Resurrection Center, and David Savage, a lay leader in The Church of Jesus Christ of Latter-day Saints (Mormons), Wilmington area. 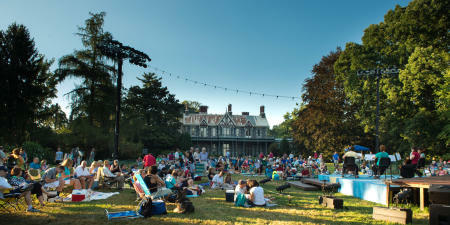 Much Ado About Nothing is Delaware Shakespeare&apos;s 16th annual summer production. Attendees are invited to bring their own chairs, blankets and picnic baskets to the park. The concession stand features picnic-appropriate sandwiches and snacks from Janssen&apos;s Market and wine sold by the bottle in the Swigg Festival Wine Shop, as well as soft drinks, candy and Delaware Shakespeare t-shirts. New this year: The Delaware Shakespeare VIP Tent will provide a place for groups of 10 or more to gather with clients, colleagues and friends under a tent before the show, where they&apos;ll be visited by Wandering Bards and be greeted by name from the stage. VIP Tent packages can be customized to include catered picnics, wine, reserved seats and more. Only one tent package is available each night of the production. Much Ado About Nothing will run for 13 performances. Performances are scheduled Wednesday through Saturday begin at 7:30 p.m., with gates opening at 6:15 p.m. for pre-show entertainment and picnics. Sunday night "Family Night" performances begin at 6 p.m. (with gates opening at 4:45 p.m.). General admission to the festival is $20. Tickets are $18 for seniors (65+), and active military (and their families) with identification. Student tickets are $16. Children age 5 and under are free at every performance. Every Sunday is "Family Night," with special activities before the performance and free admission for children 12 and under, when accompanied by an adult. A limited number of reserved lawn chairs are available at each performance. These "Saved Seats" are set up in premium locations in the first row of the "lawn chairs" section, behind blankets and low-backed beach chairs. Reservations must be made in advance and cost $40. To purchase tickets, go to www.delshakes.org or purchase at the door. The Summer Festival is sponsored by Janssen&apos;s Market, Delmarva Power, Highmark Delaware, Planet Ten, Swigg, Labware and Evergreen Waste Services, with support from the Longwood Foundation, Crystal Trust, Marmot Foundation, The Brandywiners and the Delaware Division of the Arts, presented in partnership with New Castle County. For more information about Much Ado About Nothing and the 2018 Festival, visit www.delshakes.org or email info@delshakes.org. 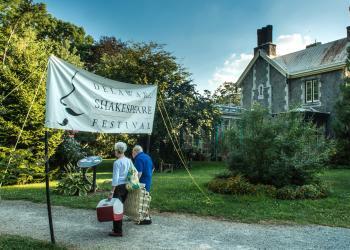 To make Delaware Shakespeare part of a fun weekend getaway to the beautiful Brandywine Valley order your free visitors guide.